I am stoked to share the great news! 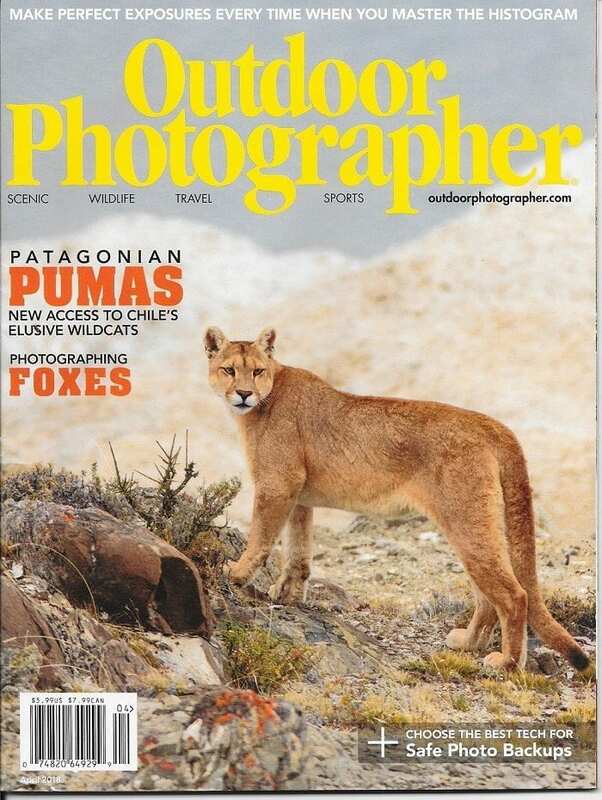 The April 2018 issue of Outdoor Photographer features my image of a puma from Patagonia on the cover. “There he is!” whispers my wife Mary O.
We’re near Torres del Paine National Park, Chile sitting in a van in the cold rain. Mary O. has just spotted a large male puma making his way down the hill to the guanaco kill we’ve been watching for the last hour. For the next 45 minutes we have the privilege of watching the interactions between this male, a female and two juvenile pumas at the kill–the sort of behavior very few folks have ever actually witnessed in the wild. The biologist with us on the photo shoot – a big cat specialist – had never seen such behavior before. Most research has been conducted on pumas in North America, where adult males such as this one – likely the mate of the female and the father of the two kittens – don’t hang around out with, and especially don’t dine with, others. This behavior in South America may transpire because the ecological fitness of the habitat minimizes the sort of competitive forces we see in more northern parts. Of course, much wild puma behavior of any kind has not been observed. Many people live their whole lives in cougar country without ever seeing one at all. When they are spotted, it’s typically only a fleeting glimpse. Researchers generally depend on tracking collared animals or using camera traps. At any other time, on any other trip this would have been the absolute pinnacle experience. On this trip however, it’s just the latest of many such incredible experiences. Over the past few days we have observed and photographed four other pumas including a pair of 6-7 month old kittens. We have seen a variety of behavior including kittens playing, a stalk, grooming, and watching the cats simply generally being the supreme masters of their domain. These are wild, free-ranging pumas going about their daily lives. Not game farm or otherwise captive animals. A year ago I would not have believed this was possible. At this location it’s not only possible, but virtually guaranteed. The secretive nature of these cats is legendary. How were we able to witness so much activity? A new conservation program in southern Chile, which focuses on compensating landowners for access to their property made this achievable. Most of our puma prowling took place on a 17,000 acre private ranch adjacent to the national park. Due to a recent rule change the park no longer allows off-trail hiking in pursuit of pumas. Thankfully, our local contact has an agreement already in place allowing access to the ranch where we can roam as we wish. This is not only good for us but good for the pumas. By collecting a fee for access, the landowner has an incentive to allow the pumas to remain on his property without persecution. Wildlife viewing and photography tours include ranch access fees, monies which go directly to the landowner and provide tangible proof of the value of pumas. Some ranches bordering the national park have even agreed to remove all sheep from the land for a trial period in order to give photo tourism a go. Even when we were observing wildlife in the park it was a far different experience than what we are used to in places like Yellowstone. If you have not lived it you’ve probably seen videos of the circus created around wildlife sightings there. Due mostly to a much lower visitation rate, we had the cats all to ourselves for 45 minutes. And what a location! Torres del Paine is an awesome photographic destination in itself with soaring dramatic peaks, turquoise blue lakes and glaciers. The pumas are just the delicious icing on this tasty cake. The primary prey for the pumas in this region is the guanaco. These wild ancestors of the llama and alpaca are abundant here and fairly tolerant of people, allowing for some great photo opportunities. They also help us locate the pumas. When the guanacos spot a puma they start sounding an alarm call. This call is very distinctive and when heard it alerts us to start looking very carefully for a puma. The pumas can be very difficult to spot as their coloring blends perfectly with the vegetation. The other large animals in the area are birds. Darwin’s rhea, Chilean flamingos and Andean condors are all local residents. The Darwin’s rhea, one of three “Lesser rhea” subspecies, are large flightless birds related to the ostrich and emu. The Darwin’s are slightly smaller than the Greater Rhea found in the Pantanal. The IUCN Red List classifies Chilean flamingos as “Near Threatened.” These birds are one of four flamingo species in South America. It is slightly smaller than the Caribbean flamingo. With a wingspan of nearly eleven feet, the Andean condor is the largest flying land bird in South America and one of the largest in the world. The IUCN lists them as “Near Threatened.” On the last day of the trip we had the pleasure of visiting a condor roost and watching eighty of these birds soaring above and below our cliff side perch. These birds kept flying above us, checking us out! This was the trip of a lifetime as few people have ever seen pumas in the wild. I was making plans for a return trip to share with a few fellow adventurers even before we left. Never in my wildest dreams did I think I would be deleting images of mountain lions because they are just not quite sharp enough. I would have been thrilled just to see one at all. But now thanks to landowner cooperation, lack of persecution, and the open terrain of the Torres del Paine region, the pumas have grown accustomed to observation (as long as it remains from a respectful distance). The result? While the hike in can prove challenging (typically a hilly one to two miles each way while bearing photo equipment and braving the famous Patagonian winds), once in place the photography – and the “awe” factor- comes easy.